The Karabisianoi (Greek: Καραβισιάνοι), sometimes anglicized as the Carabisians, were the main forces of the Byzantine navy from the mid-7th century until the early 8th century. 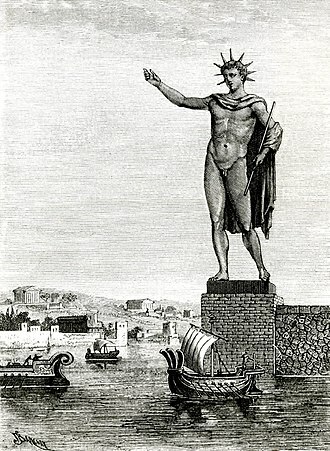 The name derives from the Greek karabos or karabis (Greek: κάραβος, καραβίς) for "ship", and literally means "people of the ships, sea-men". The Karabisianoi were the first new permanent naval establishment of the Byzantine Empire, formed to confront the Muslim expansion at sea. They were disbanded and replaced with a series of maritime themes some time in 718–730. The Karabisianoi were established sometime in the second half of the 7th century in response to the Muslim conquests. Various scholars have suggested that it evolved from the remainders of the old quaestura exercitus or the late Roman field army of the Illyricum, but these suggestions remain hypothetical. The date of the fleet's establishment is unclear: some scholars propose that it was established in the 650s or 660s by Emperor Constans II (r. 641–668), following the major naval defeat at the Battle of the Masts in 655, while others think that it was created after the First Arab Siege of Constantinople in 672–678, where the Arab advance by sea seems to have been almost unopposed. The first certain reference to the Karabisianoi is during the siege of Thessalonica by the Slavs in circa 680, and then in a letter of Emperor Justinian II (r. 685–695) to Pope Conon in 687. The Karabisianoi are widely held to have been the first permanently maintained naval force of the Byzantine Empire. Before that, as the Mediterranean was a "Roman lake", only a limited number of relatively small warships were maintained in the main harbours and along the fluvial borders of the Empire for patrols and transport tasks. Larger Byzantine fleets were assembled only on an ad hoc basis for specific expeditions. The Karabisianoi were formed in largely the same way as the land army's themes: they were a distinct military corps named after its soldiers, and headed by a stratēgos (stratēgos tōn karabōn/tōn plōimatōn). Although they are often referred to as the "Carabisian Theme", this designation is erroneous as the Karabisianoi remained a purely military command and do not appear to have constituted a specific territorial division like the land themes. The stratēgos' base is not known, with suggestions ranging from Rhodes to Keos and Samos. The Karabisianoi have also been variously seen as an essentially provincial fleet, tasked with defending the southern coast of Asia Minor from Miletus to Seleucia in Cilicia, the Aegean islands and the imperial holdings in southern Greece, and serving alongside a central imperial fleet in Constantinople, or a command encompassing virtually the entire effective force of the Byzantine navy, and active in both defensive and offensive capacities from the Black Sea to the Exarchate of Africa. The Karabisianoi were greatly strengthened under Emperor Justinian II, who settled several thousand Mardaites to serve as rowers and marines along the southern coasts of Asia Minor. Justinian also created a separate theme and fleet for southern Greece, named "Hellas". The Karabisianoi played a major role in the failed expedition to recover Carthage in 697–698, and led the revolt that installed the admiral Apsimar (Tiberios III) on the throne. The last mention of the stratēgos of the Karabisianoi is in 710/711, and it is not until 732 that his chief successor, the stratēgos of the Cibyrrhaeot Theme, is mentioned. This has led to two different suggestions as to the date and reason of the disbandment of the Karabisianoi. 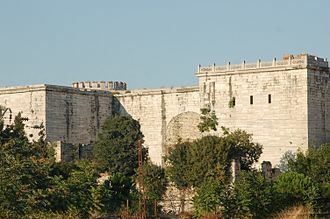 One view holds that this was after the Second Arab Siege of Constantinople (717–718), circa 719, either due to a poor performance during the previous years or because they assisted in a rebellion against Emperor Leo III the Isaurian (r. 717–741), while the others hold that it happened as late as circa 727, after another unsuccessful revolt against Emperor Leo III. The Karabisianoi were replaced chiefly by the new Cibyrrhaeot Theme, the first naval theme (thema nautikon), which was a formerly subordinate command under a droungarios and covered the southern coast of Asia Minor. In other coastal provinces, various smaller fleets and squadrons under droungarioi and other officers were tasked with local defence. 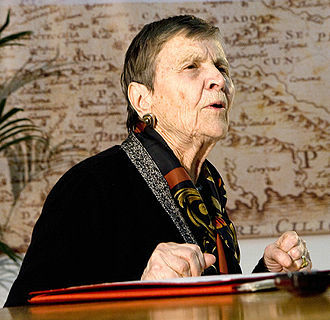 ^ a b Haldon 1999, p. 74. ^ Treadgold 1997, p. 73. ^ Ahrweiler 1966, p. 12. ^ Treadgold 1997, pp. 315, 382. ^ Cosentino 2008, p. 602. ^ a b c Pryor & Jeffreys 2006, p. 25. ^ Ahrweiler 1966, pp. 22–23. ^ a b c d Nesbitt & Oikonomides 1994, p. 150. ^ a b c d ODB, "Karabisianoi" (C. Foss), pp. 1105–1106. ^ Ahrweiler 1966, pp. 19–20, 22; Cosentino 2008, pp. 578–583. ^ Ahrweiler 1966, pp. 24–25. ^ Treadgold 1997, p. 315. ^ Ahrweiler 1966, pp. 23–25. ^ Treadgold 1997, p. 332. ^ Treadgold 1997, pp. 337–338, 383. ^ Ahrweiler 1966, p. 26. ^ Ahrweiler 1966, pp. 26–31; Pryor & Jeffreys 2006, p. 32. ^ Treadgold 1997, p. 352; Whittow 1996, p. 167. ^ Ahrweiler 1966, pp. 50–51; Nesbitt & Oikonomides 1994, p. 151. Ahrweiler, Hélène (1966). Byzance et la mer. La marine de guerre, la politique et les institutions maritimes de Byzance aux VIIe-XVe siècles (in French). Paris: Presses universitaires de France. Haldon, John F. (1999). Warfare, State and Society in the Byzantine World, 565-1204. London: University College London Press (Taylor & Francis Group). ISBN 1-85728-495-X. Pryor, John H.; Jeffreys, Elizabeth M. (2006). The Age of the ΔΡΟΜΩΝ: The Byzantine Navy ca. 500–1204. Leiden and Boston: Brill Academic Publishers. ISBN 978-90-04-15197-0. Whittow, Mark (1996). The Making of Byzantium, 600–1025. Berkeley and Los Angeles, California: University of California Press. ISBN 0-520-20496-4. Morrison, John; Gardiner, Robert (2004). The Age of the Galley: Mediterranean Oared Vessels since pre-Classical Times. London: Conway Maritime Press. ISBN 978-0-85177-955-3. Miletus was an ancient Greek city on the western coast of Anatolia, near the mouth of the Maeander River in ancient Caria. Its ruins are located near the village of Balat in Aydın Province. Before the Persian invasion in the middle of the 6th century BC, Miletus greatest wealth and splendor was reached during the Hellenistic era and Roman times. Evidence of first settlement at the site has been inaccessible by the rise of sea level. The first available evidence is of the Neolithic, in the early and middle Bronze age the settlement came under Minoan influence. Legend has it that an influx of Cretans occurred displacing the indigenous Leleges, the site was renamed Miletus after a place in Crete. The Late Bronze Age, 13th century BC, saw the arrival of Luwian language speakers from south central Anatolia calling themselves the Carians, in that century other Greeks arrived. The city at that time rebelled against the Hittite Empire, after the fall of that empire the city was destroyed in the 12th century BC and starting about 1000 BC was resettled extensively by the Ionian Greeks. Legend offers an Ionian foundation event sponsored by a founder named Neleus from the Peloponnesus, the Greek Dark Ages were a time of Ionian settlement and consolidation in an alliance called the Ionian League. 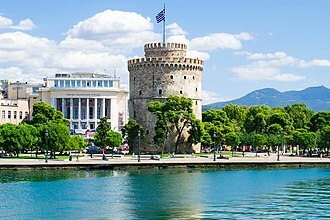 The Archaic Period of Greece began with a sudden and brilliant flash of art, Miletus is the birthplace of the Hagia Sophias architect Isidore of Miletus and Thales, a pre-Socratic Greek philosopher in c.624 BC. The ruins appear on maps at 37°31. 8N 27°16. 7E, about 3 km north of Balat and 3 km east of Batıköy in Aydın Province. In antiquity the city possessed a harbour at the entry of a large bay. The harbour of Miletus was additionally protected by the small island of Lade. Over the centuries the gulf silted up with alluvium carried by the Meander River, there is a Great Harbour Monument where, according to the New Testament account, the apostle Paul stopped on his way back to Jerusalem by boat. He met the Ephesian Elders and headed out to the beach to bid farewell, recorded in the book of Acts 20. Justinian II, surnamed the Rhinotmetos or Rhinotmetus, was the last Byzantine Emperor of the Heraclian Dynasty, reigning from 685 to 695 and again from 705 to 711. His second reign was even more despotic than the first, and it too saw his eventual overthrow in 711, Justinian II was eldest son of Emperor Constantine IV and Anastasia. 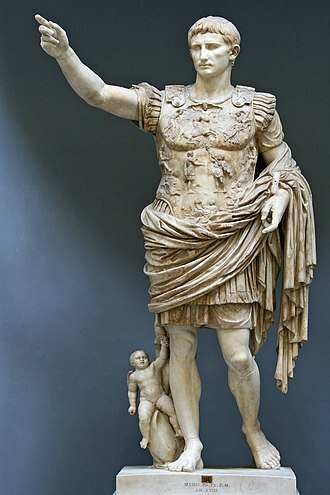 His father raised him to the throne as joint emperor in 681 on the fall of his uncles Heraclius and Tiberius, in 685, at the age of sixteen, Justinian II succeeded his father as sole emperor. Due to Constantine IVs victories, the situation in the Eastern provinces of the Empire was stable when Justinian ascended the throne. After a preliminary strike against the Arabs in Armenia, Justinian managed to augment the sum paid by the Umayyad Caliphs as an annual tribute, the incomes of the provinces of Armenia and Iberia were divided among the two empires. In 687, as part of his agreements with the Caliphate, Justinian removed from their native Lebanon 12,000 Christian Maronites, additional resettlement efforts, aimed at the Mardaites and inhabitants of Cyprus allowed Justinian to reinforce naval forces depleted by earlier conflicts. Justinian took advantage of the peace in the East to regain possession of the Balkans, in 687 Justinian transferred cavalry troops from Anatolia to Thrace. With a great campaign in 688–689, Justinian defeated the Bulgars of Macedonia and was finally able to enter Thessalonica. The subdued Slavs were resettled in Anatolia, where they were to provide a force of 30,000 men. Emboldened by the increase of his forces in Anatolia, Justinian now renewed the war against the Arabs, with the help of his new troops, Justinian won a battle against the enemy in Armenia in 693, but they were soon bribed to revolt by the Arabs. The result was that Justinian was comprehensively defeated at the Battle of Sebastopolis, caused by the defection of most of his Slavic troops, while he himself was forced to flee to the Propontis. There, according to Theophanes, he took out his frustration by slaughtering as many of the Slavs in and around Opsikion as he could lay his hands on. 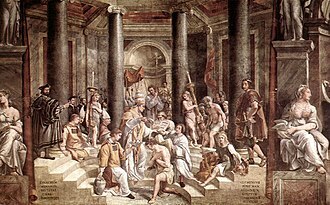 In the meantime, a Patrician by the name of Symbatius proceeded to rebel in Armenia, and opened up the province to the Arabs, the Emperors bloody persecution of the Manichaeans and suppression of popular traditions of non-Orthodox origin caused dissension within the Church. Leo III the Isaurian, known as the Syrian (Greek, Λέων Γ΄ ὁ Ἴσαυρος, Leōn III ho Isauros, was Byzantine Emperor from 717 until his death in 741. He put an end to the Twenty Years Anarchy, a period of instability in the Byzantine Empire between 695 and 717, marked by the rapid succession of several emperors to the throne. He successfully defended the Empire against the invading Umayyads and forbade the veneration of icons, whose original name was Konon, was born in Germanikeia in the Syrian province of Commagene. After the victory of Justinian II, Konon was dispatched on a mission to Alania. Konon was appointed commander of the Anatolic theme by Emperor Anastasius II, on his deposition, Konon joined with his colleague Artabasdus, the stratēgos of the Armeniac theme, in conspiring to overthrow the new Emperor Theodosius III. Artabasdus was betrothed to Anna, daughter of Leo as part of the agreement, Leo entered Constantinople on 25 March 717 and forced the abdication of Theodosios III, becoming emperor as Leo III. 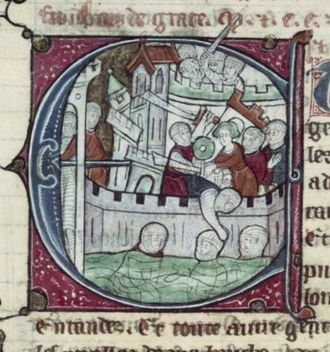 The new Emperor was immediately forced to attend to the Second Arab siege of Constantinople, the Arabs were Umayyad forces sent by Caliph Sulayman ibn Abd al-Malik and serving under his brother Maslama ibn Abd al-Malik. They had taken advantage of the discord in the Byzantine Empire to bring a force of 80,000 to 150,000 men. Careful preparations, begun three years earlier under Anastasius II, and the resistance put up by Leo wore out the invaders. 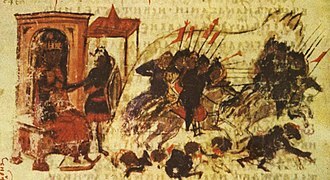 An important factor in the victory of the Byzantines was their use of Greek fire, the Arab forces fell victim to Bulgarian reinforcements arriving to aid the Byzantines. Leo was allied with the Bulgarians but the chronicler Theophanes the Confessor was uncertain if they were serving under Tervel of Bulgaria or his eventual successor Kormesiy of Bulgaria. Sulayman himself had died the year and his successor Umar II would not attempt another siege. The siege had lasted 12 months, having thus preserved the Empire from extinction, Leo proceeded to consolidate its administration, which in the previous years of anarchy had become completely disorganized. Strategos or Strategus, plural strategoi, is used in Greek to mean military general. In the Hellenistic world and the Byzantine Empire the term was used to describe a military governor. In the modern Hellenic Army it is the highest officer rank, the ten were of equal status, and replaced the polemarchos, who had hitherto been the senior military commander. At Marathon in 490 BC they decided strategy by majority vote, at this date the polemarchos had a casting vote, and one view is that he was the commander-in-chief, but from 486 onwards the polemarchos, like the other archontes, was appointed by lot. The annual election of the strategoi was held in the spring, if a strategos died or was dismissed from office, a by-election might be held to replace him. 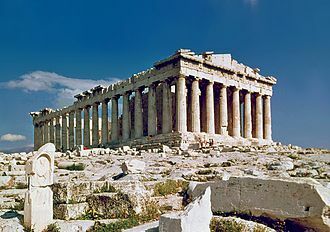 This system continued at least until ca, 356/7 BC, but by the time Aristotle wrote his Constitution of the Athenians in ca.330 BC, the appointments were made without any reference to tribal affiliation. Hence, during the Hellenistic period, although the number of the tribes was increased, as political power passed to the rhetores in the 5th century, the strategoi were limited to their military duties. Originally, the strategoi were appointed ad hoc to various assignments and this was generalized in Hellenistic times, when each strategos was given specific duties. One of them, the strategos epi ta hopla, ascended to major prominence in the Roman period, the Athenian people kept a close eye on their strategoi. If the vote went against anyone, he was deposed and as a rule tried by jury, the strategos as an office is attested at least for Syracuse from the late 5th century BC, and in the koinon of the Arcadians in the 360s BC. The title of strategos autokrator was used for generals with broad powers, thus Philip II of Macedon was elected as strategos autokrator of the League of Corinth. 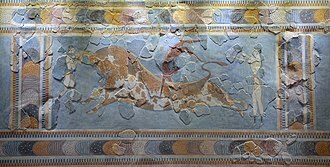 g. In the Hellenistic empires of the Diadochi, notably Lagid Egypt, for which most details are known, in Egypt, the strategoi were originally responsible for the Greek military colonists established in the country. Quickly, they assumed a role in the administration alongside the nomarches, the governor of each of the nomes. The praetorian prefecture of Illyricum was one of four praetorian prefectures into which the Late Roman Empire was divided. The administrative centre of the prefecture was Sirmium, after 379, initially the territories comprising the praetorian prefecture of Illyricum belonged to the Prefecture of Italy and Africa. It was as established as a prefecture in its own right during the dynastic struggles between the sons of Constantine the Great which followed his death in 337. It remained in existence until 361, when it was abolished by emperor Julian, in that year the Diocese of Pannonia was again added to Italy as the Diocese of Illyricum, while Macedonia and Dacia were briefly ruled directly by Theodosius I from Thessalonica. During the years 384-395 they were incorporated in the Italian prefecture, except a short period in 388-391. On this occasion, it appears that the capital was to Sirmium. 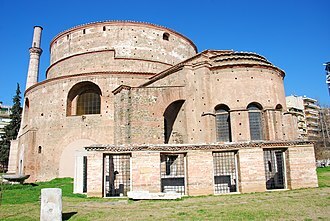 Likewise, the intention of Justinian I to move the capital to his new city of Justiniana Prima in the 540s remained unfulfilled, a history of the Eastern Roman empire from the fall of Irene to the accession of Basil I. The Imperial Roman army of the Principate underwent a significant transformation as a result of the chaotic 3rd century. Unlike the army of the Principate, the army of the 4th century was heavily dependent on conscription, scholarly estimates of the size of the 4th-century army diverge widely, ranging from ca.400,000 to over one million effectives. This is due to evidence, unlike the much better-documented 2nd-century army. The main change in structure from the 2nd-century army was the establishment of large armies, typically containing 20. These were normally based near the capitals, thus far from the Empires borders. These armies primary function was to deter usurpers, and they campaigned under the personal command of their emperors. The legions were split up into smaller units comparable in size to the regiments of the Principate. Infantry adopted the more protective equipment of the Principate cavalry, the role of cavalry in the late army does not appear to have been greatly enhanced as compared with the army of the Principate. The evidence is that cavalry was much the same proportion of overall army numbers as in the 2nd century, the cavalry of the Late Roman army was endowed with greater numbers of specialised units, such as extra-heavy shock cavalry and mounted archers. 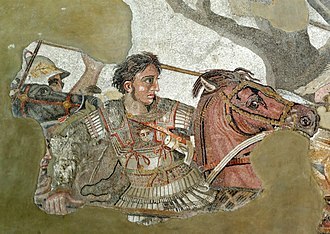 During the 4th century, the cavalry acquired a reputation for incompetence and cowardice for their role in three major battles, in contrast, the infantry retained its traditional reputation for excellence. 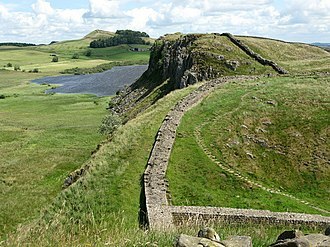 The 3rd and 4th centuries saw the upgrading of many existing border forts to make more defensible. The interpretation of this trend has fuelled a debate whether the army adopted a defence-in-depth strategy or continued the same posture of forward defence as in the early Principate. Whatever the defence strategy, it was less successful in preventing barbarian incursions than in the 1st. This may have due to heavier barbarian pressure, and/or to the practice of keeping large armies of the best troops in the interior. Much of our evidence for 4th century army unit deployments is contained in a single document, 395–420, a manual of all late Roman public offices and civil. The themes or themata were the main administrative divisions of the middle Byzantine Empire. The theme system reached its apogee in the 9th and 10th centuries, as older themes were split up and the conquest of territory resulted in the creation of new ones. The original theme system underwent significant changes in the 11th and 12th centuries, during the late 6th and early 7th centuries, the Eastern Roman Empire was under frequent attack from all sides. The Sassanid Empire was pressing from the east on Syria, Egypt and Avars raided Thrace, Macedonia and Greece and settled in the Balkans. The Lombards occupied northern Italy, largely unopposed and these developments overturned the strict division of civil and military offices, which had been one of the cornerstones of the reforms of Diocletian. This trend had already featured in some of the reforms of Justinian I in the 530s. 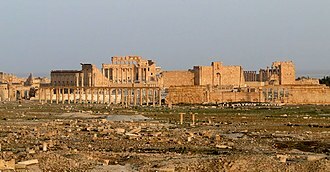 However, in most of the Empire, the old system continued to function until the 640s, the rapid Muslim conquest of Syria and Egypt and consequent Byzantine losses in manpower and territory meant that the Empire found itself struggling for survival. In order to respond to this crisis, the Empire was drastically reorganized. The origin and early nature of the themes has been disputed amongst scholars. The very name thema is of uncertain etymology, but most scholars follow Constantine Porphyrogennetos, the date of their creation is uncertain. 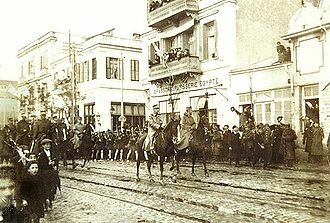 For most of the 20th century, the establishment of the themes was attributed to the Emperor Heraclius, according to Ostrogorsky, this shows that the process of establishing troops in specific areas of Asia Minor has already begun at this time. This view has been objected to by other historians however, and more recent scholarship dates their creation later, to the period from the 640s to the 660s, tied to the question of chronology is the issue of a corresponding social and military transformation. The traditional view, championed by Ostrogorsky, holds that the establishment of the themes meant the creation of a new type of army. In his view, instead of the old force, heavily reliant on foreign mercenaries, each of the new themes encompassed several of the older provinces, and with a few exceptions, seems to have followed the old provincial boundaries. By the late 5th century, the Western Mediterranean had fallen into the hands of barbarian kingdoms. The conquests of Justinian I restored Roman control over the entire sea, which would last until the Muslim conquests in the latter half of the 7th century. Emperor Leo III the Isaurian and his son and successor, Constantine V. Together, they spearheaded a revival of Byzantine fortunes against the Arabs, but also caused great internal strife because of their iconoclastic policies. The Saracen pirate fleet sails towards Crete. From the Madrid Skylitzes manuscript. The Tetrarchs, a porphyry statue on Venice's Basilica di San Marco, shows the emperor Diocletian and his three imperial colleagues. To the left, Diocletian and Maximianus, the two Augusti (co-emperors); to the right, Galerius and Constantius Chlorus, the two Caesars (deputy emperors). Note the woollen "Pannonian" caps commonly worn (out of combat) by officers in the late army as a result of the pervasive influence of the Danubian officer class; and the sword grips with eagle-head pommels. Reenactor wearing the typical equipment of a late 3rd-century foot soldier. The helmet is a Niederbieber type, with cross-pattern reinforcing ridges on the top of the bowl, and cheek-guards which can be fastened together. The sword is a spatha (median blade length 900 mm/36 inches), used by the cavalry only in the 1st and 2nd centuries. This soldier carries a spiculum, a heavy pilum-type javelin. Note the chain mail (lorica hamata) shirt and oval shield. Clothing consisted of a long-sleeved tunic, trousers and boots. The equipment of a 4th-century infantryman was very similar to the 3rd century, save that the spiculum was usually replaced by a heavy thrusting-spear (hasta) and the helmet was predominantly of the "Intercisa type". Fresco from the synagogue in the Roman fortified frontier city of Dura Europos dating to c. 250 AD. The centre shows unarmoured light cavalry charging with lances, the foreground and background show infantry fighting with spathae (long-bladed swords); they are equipped with knee-length scale armours, some with full-length sleeves. Coin of the Rashidun Caliphate with figure of Constans II standing facing, holding cross-tipped staff and globus cruciger. Pseudo-Byzantine types. Struck circa 647-670. A solidus (coin) of Constans II that was minted in Carthage. 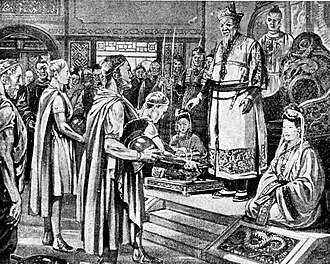 Illustration of the Byzantine embassy to Tang Taizong in 643 CE. 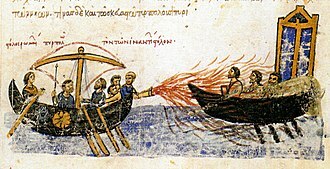 Depiction of the use of Greek fire, from the Madrid Skylitzes. It was used for the first time during the first Arab siege of Constantinople, in 677 or 678. 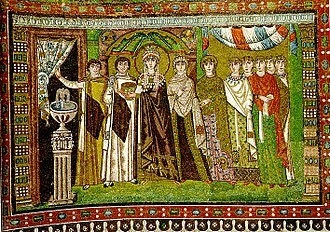 Justinian depicted on one of the famous mosaics of the Basilica of San Vitale, Ravenna. 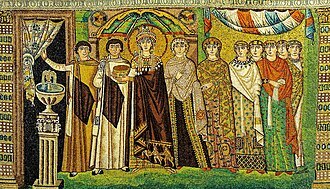 Theodora with her retinue (mosaic from Basilica of San Vitale, Ravenna). Justinian's influential wife was a former mime actress, whose earlier life is vividly described by Procopius in Secret History.